If you have yet to "give your soul to the dance," or you want to fall under the hypnotic spell of 2018's Suspiria again and again, then you'll be happy to know that 2018's Suspiria is coming to Amazon Prime Video on May 3rd. You can view the Amazon Prime announcement video and poster below, and in case you missed it, go here to read Heather Wixson's review of the new Suspiria and watch her interviews with the cast and crew. 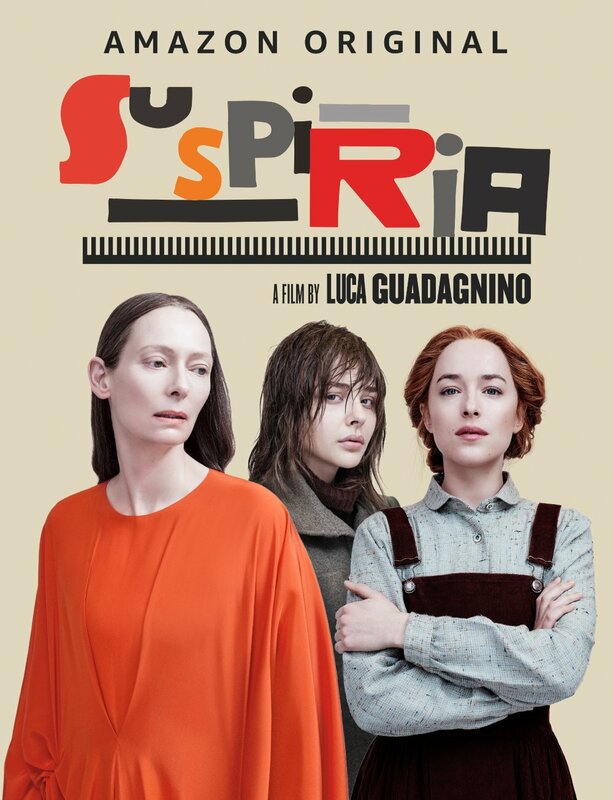 Directed by Luca Guadagnino, written by David Kajganich, and based on Dario Argento's 1977 film of the same name, Suspiria stars Dakota Johnson, Tilda Swinton, Mia Goth, Lutz Ebersdorf, and Chloë Grace Moretz. Synopsis: "A darkness swirls at the center of a world-renowned dance company, one that will engulf the troupe's artistic director (Swinton), an ambitious young dancer (Johnson), and a grieving psychotherapist (Ebersdorf). Some will succumb to the nightmare. Others will finally wake up."